Published: April 16th, 2019 by Simon. Filed in Kitchen and tagged benchtops, laminate benchtops, stone benchtops. The benchtop is one of the most functional parts of any kitchen. 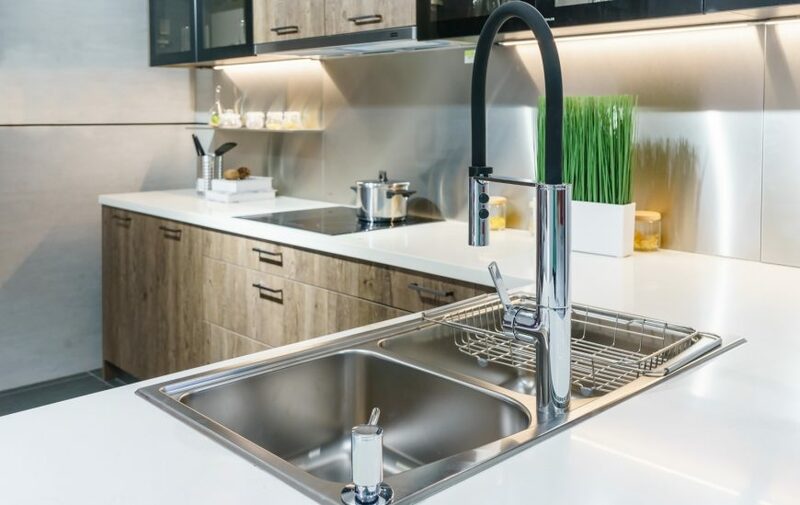 Not only does it provide the all-important space for preparing meals and placing utensils, but it can also play a big role in determining the look of a kitchen. However, most people do not rely on professionals when it comes to choosing and installing a kitchen benchtop. While the Houzz & Home ‘Overview of Home Renovation in 2017 and 2018’ report found that a kitchen designer or renovator is the third most hired professional for a home renovation, only 11% of homeowners sought this service. This proves that homeowners today trust their design instinct and are opting for DIY kitchen renovations. As the head of purchasing at Ross’s Discount Home Centre, I meet customers looking to purchase kitchen benchtops in Perth often. Over the years, I’ve come to learn what makes and what doesn’t make a great benchtop. Today, I’ll share some tips with you to help you choose the right kitchen benchtop design for your upcoming renovation. When it comes to choosing a kitchen benchtop, you need to consider your cabinetry. Your benchtop material and pattern match or complement the rest of your kitchen. Therefore, I recommend that you decide on these two elements together. 2-pack or plain-finish cabinets are easier to work with. You can pretty much choose any material for your benchtop; just make sure the pattern complements the colour of your cabinets (see below for more information on colours). Wooden cabinetry is a little hard to work with as it is not easy to match the wood grain. Therefore, you’re best to choose a stone or laminate benchtop with a light texture that complements the grain rather than trying to match it. To match the colour of your benchtop to the rest of your kitchen, you can either choose complementing tones, a monochrome palette or a contrasting colour scheme. Your safest bet is to stick to neutral tones as they will complement just about everything. Neutral benchtop tones will also allow you to choose colours for your kitchen tiles more freely. Neutral tones will help you create a complementary colour scheme. And, by including stone and metallic elements in your kitchen, you can create a natural look. To create a monochromatic space, white on white, grey on grey, all black and any combination of white, black and grey look great and are very much on trend in 2019. Alternatively, you can also choose blue on grey, olive green on grey, white and timber and French grey to create a sophisticated looking monochromatic kitchen. Don’t be afraid of experimenting a little with warm neutrals, rich browns, blues and toned-down yellows as accents. These will help you add a fresh touch to your space. And, if you’re willing to be a little creative, you can mix and match colours to create a contrasting colour scheme. Contrasting colour schemes can be used to make a fun style statement in your kitchen. Cream on Navy and Red on White are some contrasting colour schemes that will help you create a vibrant and lively kitchen. Where to find the best quality kitchen benchtops in Perth? For the best quality kitchen benchtops in Perth at the most affordable prices, look no further than Ross’s Discount Home Centre. We offer a huge selection of laminate benchtops and engineered stone benchtops in a variety of designs, patterns and colours for you to choose. Our products are always in stock and ready to be dispatched. With us around, you are sure to find a benchtop of your choice that’ll allow you to create the kitchen of your dreams! There are certain considerations you need to make before purchasing kitchen benchtops in Perth. First of all, consider the material and pattern of the benchtop and make sure that it complements the finish and texture of your cabinetry. Decide on a complementary, monochromatic or contrasting colour scheme and choose a benchtop colour accordingly. If you’re looking to purchase a new benchtop for your kitchen, Ross’s Discount Home Centre can help you out. We offer a large range of modern stone benchtops and affordable laminate benchtops at the most competitive prices, along with free delivery across Perth Metro. To check out our range of kitchen benchtops in Perth, visit our showroom or shop from our online store today!